You might think you're ready for a zombie uprising, but I bet you're wrong. Sure, you've got the survival guides, the canned goods, the power generator, water and concrete slab shelter. 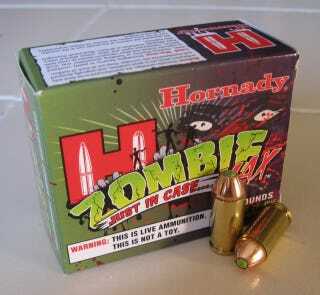 But do you have a crate or two of Hornady's Zombie Max bullets? No? Well then you're fucked. Anyone who's watched a half a season of The Walking Dead or seen 1.5 George Romero movies knows that you need plenty of ammo to make it through the waves of shambling dead that will absolutely be coming for you once you somehow become the one percent of the human population not undead. The honest-to-god, really-real Zmax round come in a variety of calibers including two assault rifle rounds, sniper rifle ammo, shotgun and three different types of pistol ammo. They back of each box comes with basic zombie survival pointers. And yes, these are real bullets for real zombies, not pretend bullets for pretend zombies. They will kill the undead dead.